Ick, another wet and rainy day in Sydney. When the weather is like this, we tend to only want warm and comforting meals. 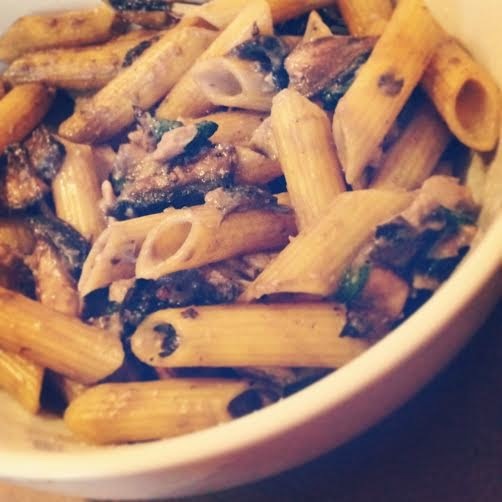 Something that fills your stomach and warms you up from the inside out - and what better meal than a creamy pasta dish! I'll be honest, the photos in this recipe do not do this pasta dish any favours. I blame the pasta - we were almost entirely out of pasta and all we had was corn penne which is so yellow that it totally overpowers the colour of any source. But trust me on this one, this recipe is so good that I'm sharing it with you despite the somewhat dodgy pictures, because you need to make it right away! 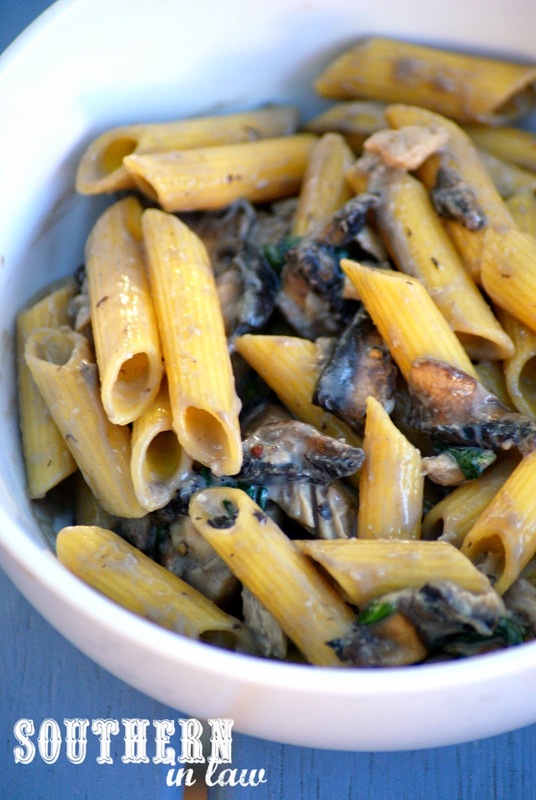 This is the pasta dish that made Jesse fall in love with mushrooms. You see, Jesse and I were both mushroom haters as kids - and it's only recently that I've started eating them. Jesse was still totally unconvinced... until he tried this pasta dish. One thing that many people think that you can't include in a "healthy diet" is creamy pasta dishes, but that's totally wrong! We eat creamy pasta dishes at least once a week, but we make them just a tiny bit differently. And no, we are not using any funky cauliflower sauces here.... have you smelt a kitchen after cooking cauliflower?! Blech! What we do use, however, is cream cheese - reduced fat cream cheese is the perfect healthier substitute for cream in pasta dishes and sauces. It also makes it super ridiculously easy and absolutely foolproof to make a quick & healthy, creamy pasta dish. 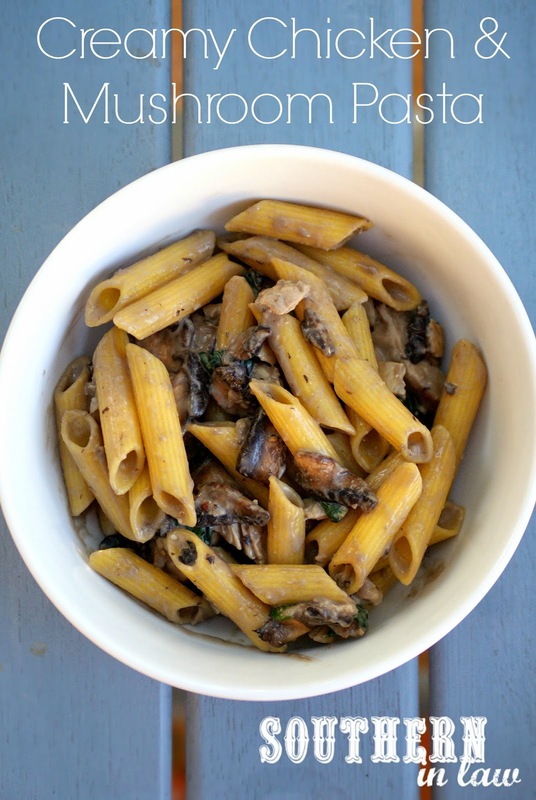 This Healthy Cream Chicken and Mushroom Pasta recipe has become a SIL family fave - and it's ridiculously easy. If you haven't done already, cook your pasta and chicken breast however you like it and set aside. Saute your garlic and mushrooms in a small saucepan until your mushrooms are cooked to your liking. Add in your spinach and cook until wilted. Next, add in your pasta and chicken and stir to combine with your mushroom mix. Add in your cream cheese and parmesan cheese and allow to melt and mix through pasta. If needed, add a dash of milk or water to make the sauce the consistency you like. Once your cheeses have melted and everything is heated through, take off the heat and serve - topping with extra parmesan if desired. But tell me, what are your go to quick weeknight meals? And what are your favourite warm and comforting rainy day meals? This is one of ours - we keep chopped chicken in small bags in the freezer so we can defrost them and cook them quickly. Our Asian Noodle Stir Fry is another go-to meal on nights when we're hard pressed for time! him/her to pay a visit this weeb site, Keep up the pleasant work.